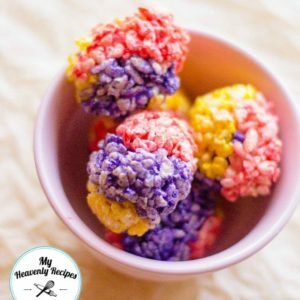 These Rice Krispies Easter Eggs are one of my favorite Rice Krispie Treats variations – so cute and colorful! These Easter treats are a nice change of pace from the “boring” plain Rice Krispies Treats recipe. 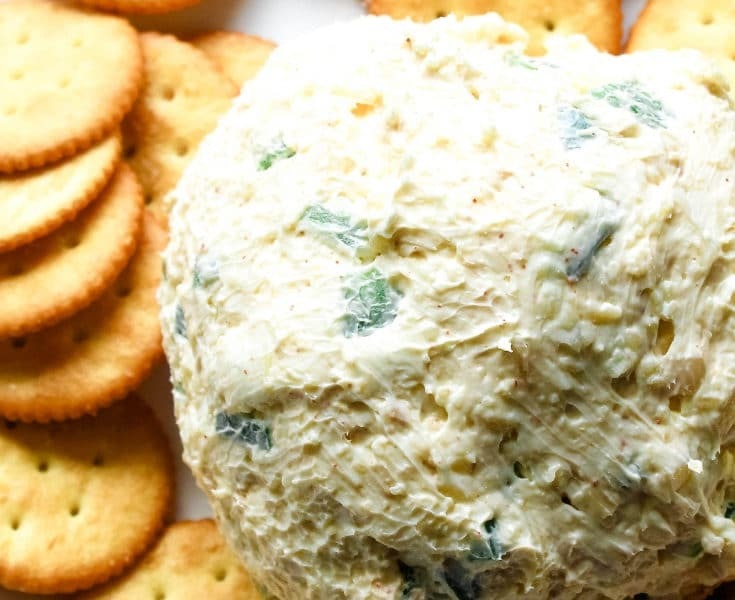 Ready to learn how to make this super fun Easter recipe?! Confession: I LOVE making fun Rice Krispies treats variations. The plain Rice Krispies treats recipe is kind of boring, but you can do so much with them to make them unique and memorable. Oh, and then there are my Watermelon Rice Krispies Treats; so adorable and they really look like a slice of watermelon! I also like to play around with the shapes of Rice Krispies, which led me to make Rice Krispies Apple Treats. They’re awesome for birthdays, teacher gifts, and anytime you want to give the kids a special treat. 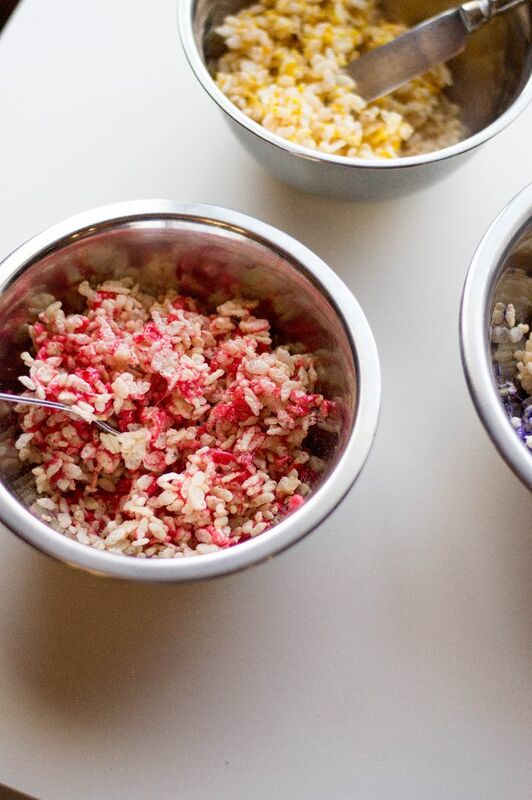 But enough about those Rice Krispies treats variations… you’re here to learn how to make Rice Krispies Easter Eggs! Rice Krispies treats don’t require messing with the oven! So, I came up with this great idea for Rice Krispies Easter Eggs and they were a HUGE hit. Try them in your household this Easter season (or any time of the year, really)! Important Note: You will be making this recipe in separate batches, so make sure you prepare three different bowls, one for each color. 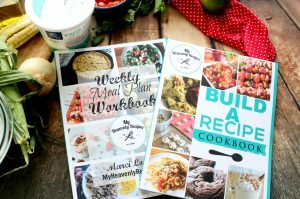 Each batch will require 1 tbsp butter, 1.5 cups mini marshmallows, and 1.5 cups rice cereal, plus one of the food coloring gels. Step #1: Line a baking sheet with parchment paper and set aside. Step #2: In a small pot on medium heat, melt butter and marshmallows together. Step #3: Once melted, pour the mixture into a bowl. Add food coloring (one color only) and mix. Don’t add too much food coloring! You want your shades to be more on the pastel side. Step #4: Add rice cereal and fold until cereal is well-coated with the marshmallow mixture. Step #5: Repeat steps 2-4 for the two other colors. 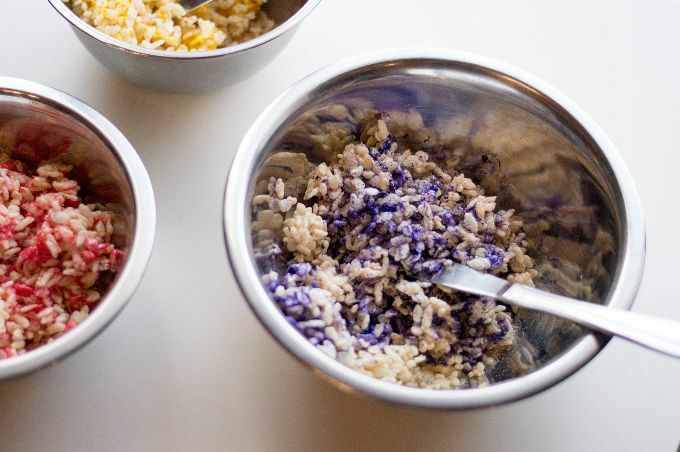 Step #6: Grab about 1-2 tbsp of each colored cereal treat mixture in your hand and form into an egg shape (feel free to mix the colors – that’s the fun in it!). Step #7: Place on lined baking sheet. Allow the treats to cool completely before serving. They make a GREAT Easter project! 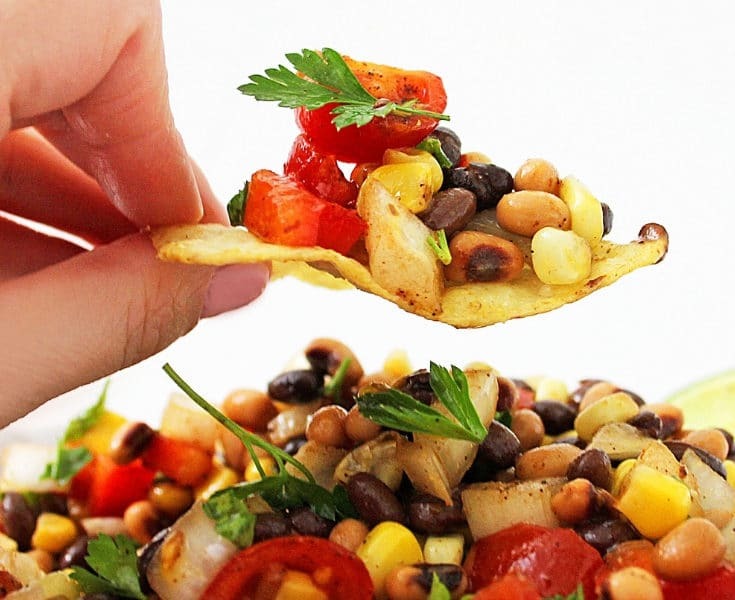 Kids will love making these. The recipe can be easily increased if you have a lot of little hands that want to help make Rice Krispies eggs! 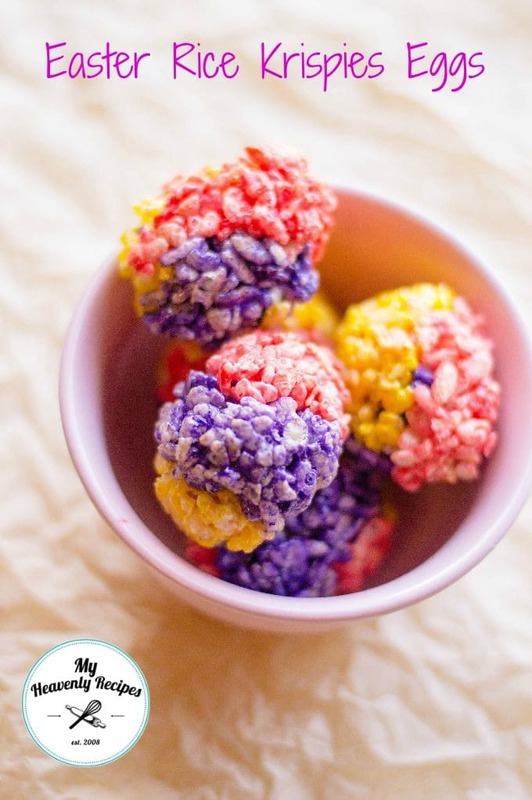 These Rice Krispies Easter Eggs are one of my favorite Rice Krispie Treats variations - so cute and colorful! These Easter treats are a nice change of pace from the "boring" plain Rice Krispies Treats recipe. 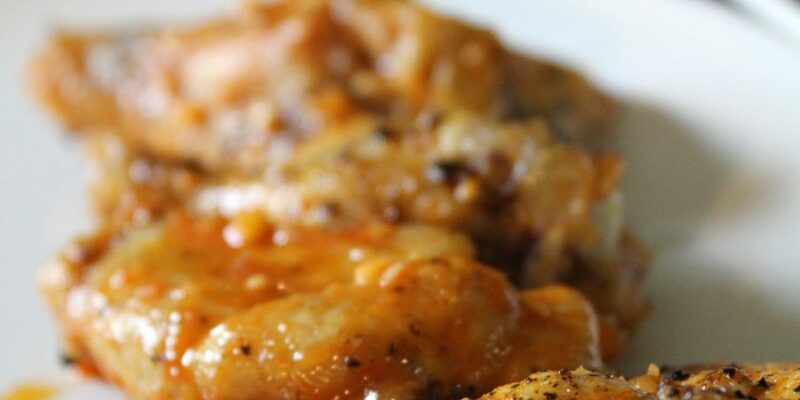 You will be making this recipe in separate batches so make sure you prepare three different bowls for each color. 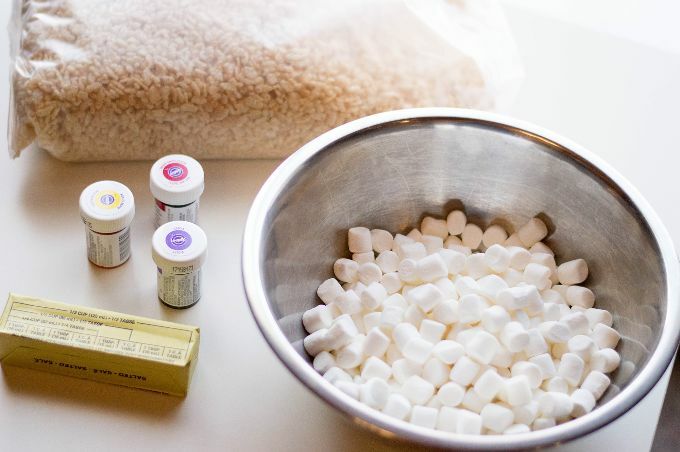 Each batch will require 1 tbsp butter, 1.5 cups mini marshmallows, and 1.5 cups rice cereal, plus one of the food coloring gels. In a small pot on medium heat, melt butter and marshmallows together. 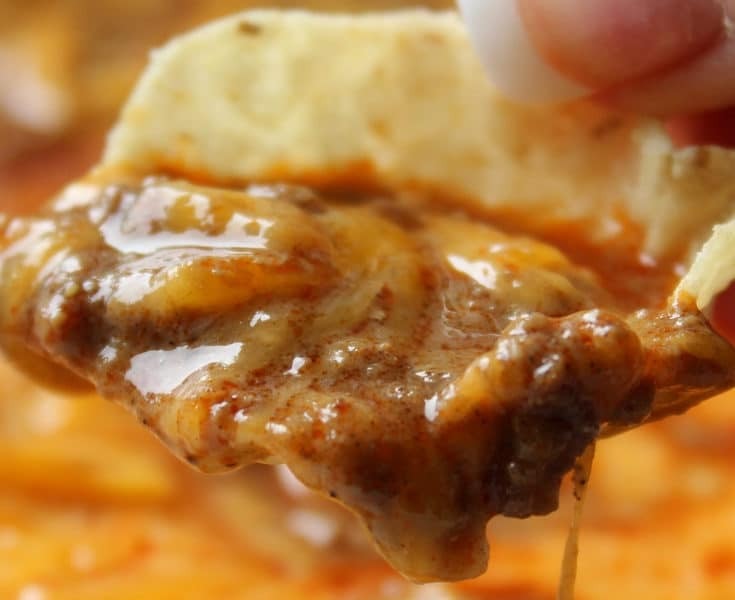 Once melted, pour into a bowl. Add food coloring and mix (don’t add too much food coloring! You want your shades to be more on the pastel side). Add rice cereal and fold until cereal is well-coated with the marshmallow mixture. Repeat steps for 2 other colors. 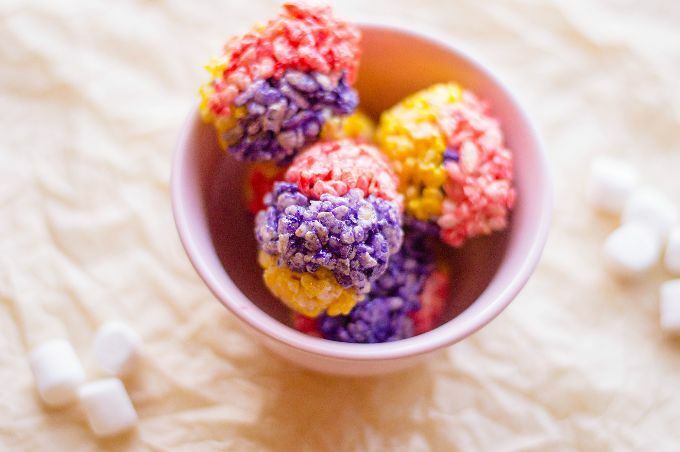 Grab about 1-2 tbsp of each colored cereal treat mixture in your hand and form into an egg shape (feel free to mix the colors – that’s the fun in it!). Place on lined baking sheet. Allow to cool completely before serving.